For the first time in many years Bridgemary competed in the local speaking competition known as Youth Speaks. This is a well-established and successful national competition organised and promoted by Rotary International in Great Britain and Ireland. The aim is to offer young people experience in speaking on a public platform as a member of a team and an incentive to formulate ideas on topical subjects. It requires discipline in dealing with a topic in a limited time and they receive impartial feedback and assessment by experienced judges. Our team comprised of Year 10 students Thushana Balachandran, Lauren Brown and Year 11 student Liberty Kappa and their speech was about Gun Crime in the USA. 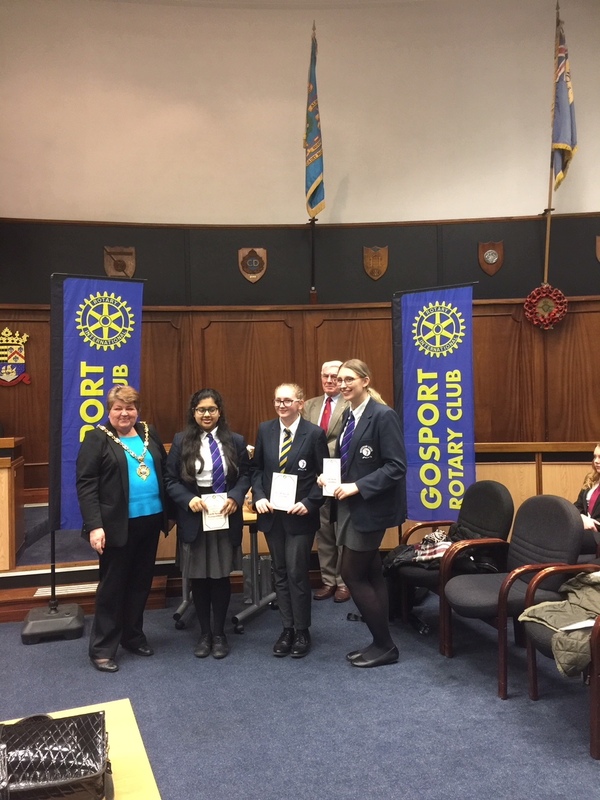 Jassmin Percy and Ronnie Pellatt in Year 10 and Hannah Graham in Year 11 also contributed to the writing and preparation in the lead up to the competition. The organisers described how all the speakers “led the audience through their subject in a clear, well-structured way which could only be done if they had put many hours of work into the presentation. They were a credit to Gosport and Fareham”. Although Bridgemary didn’t win this time, we did receive some very pleasing feedback from the organiser of the competition Ray Drake (Gosport Rotary Club). “All the teams were winners,” he said, “and for a first timer, after so many years, Bridgemary did exceptionally well; I expect to see their name on the shield once again soon”. We have been set a challenge and look forward to competing in next year’s competition.